1. The Boxing Officer is a very important appointment at Unit level and wherever possible must be a commissioned officer and is normally a Late Entry Officer. This section aims to provide the Boxing Officer with all of the information required to safely and effectively manage the sport of boxing within a unit. iii. Ensure that the Health and Safety Officer has signed off all Risk Assessments that pertain to the unit boxing team. c. Boxers’ Medicals are booked with the unit SMO; boxers may not undertake any contact boxing training until they have passed an Annual Medical. d. Ensure all training programmes are reviewed by the Senior Coach (minimum Level 2) and RAPTCI. e. Ensure that all sparring is supervised in an appropriate location in accordance with the advice given in Section 5 paragraph 14 and with an action plan for any serious injuries, ensure that the sparring log is completed for every session. f. Ensure that the unit has completed all of the procedures that you have to gain your affiliation. g. Ensure that your boxers and coaches adhere to the unit Risk Assessments and be aware of the unit Action Plan. h. Check the club is affiliated to England Boxing by contacting Army BA. i. If in Scotland, Ireland or Wales check the club is affiliated to the National Governing body, your boxers will not be insured if they train at a gym that is not affiliated, the Army BA should be contacted if there is any doubt. j. Check the coaches are registered and qualified, you can do this via Army BA registrations officer 94 222 7090.
k. Coaching courses can be run at unit or regional level for both Level 1 or Level 2 qualifications. Such courses unfortunately cannot be funded by the Army BA. Boxing Officers planning a course must contact the Army BA Secretary to arrange appropriately qualified Tutors and Assessors with extensive knowledge service boxing. An application to host or run a unit or garrison coaching course can be found within Section 5 Coaching. Military personnel only on military property. m. Read Section 8 Event Organisation. n. Speak to Regional Secretary to discuss dates and the availability of Officials and competition equipment. o. Agree a date with the Commanding Officer. q. Complete a Certificate of Assurance Application Section 8 Annex A.
r. Formally request officials support from Regional Secretary. t. Ensure there is a Ringside Physician (Dr) nominated for your event. u. Send a copy of the Administrative Instruction to Regional Secretary and copy to Army BA. v. Boxing against civilians or on civilian property creates complications for Army BA registered personnel so early engagement with the Regional Secretary is important. i. Events on civilian property – these must be licensed by England Boxing either directly or by the Region, this MUST be arranged by Army BA Sec. ii. 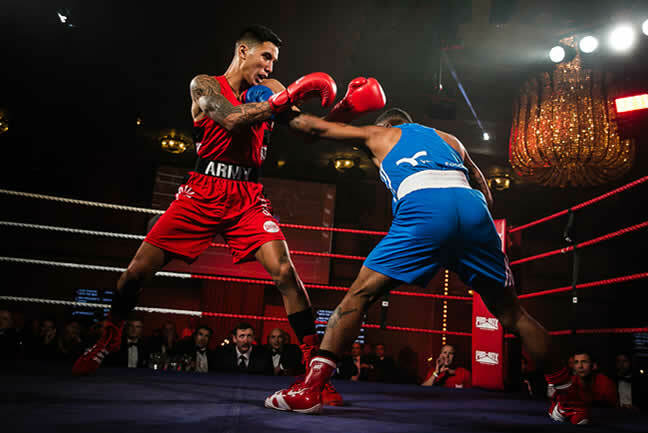 Events involving civilians on military property – permission to include the civilian boxers must be sought from the England Boxing Region by Army BA. iii. Military Boxers competing on civilian shows – A letter must be provided by the Commanding Officer to put the boxers ON DUTY this can be found at Annex C to Section 8 this is to be copied to Army BA. For all of the above the officials and the coaches must be registered with England Boxing and this involves having an in date DBS, this can take up to 12 weeks; there is no short cut to this and must be adhered to; see Section 7 para 16 onwards. w. For events overseas Read Section 8 Annex B and then contact the ARMY BA Secretary on 94 222 7089 as permission must be sought from Army Sports Control Board via an Overseas Visit Application (2017DIN10-025). x. Once permission from ASCB is granted Boxing Officers must complete the Permission to Box Abroad Application at Section 8 Annex C/1 this is for England Boxing to authorise the trip. Boxing Officers are to note that Boxing means sparring as well as competitive boxing.